Situations and events may get out of hand today and it is a good time to take stock of where you stand and don’t go rushing into an argument or disagreement in order to defend yourself. The Five of Wands — much like today’s Mars / Mercury square — can mean that no matter what you say or do there is going to be tension. 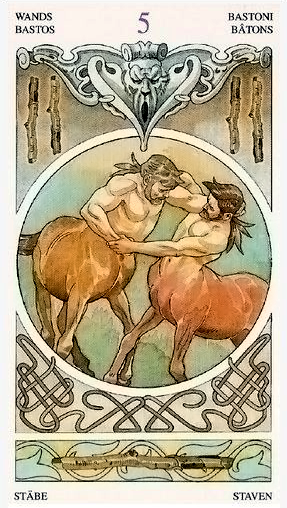 There is something reminiscent in the centaurs as they tussle with each other and go head to head that says neither is backing down and they are fairly evenly matched in strength. There is no winner here. If you rush in you may well find yourself at a standstill and within such a state of high emotions that the clear feeling that you have to act and do something to remove yourself from this emotion will vanish. That may also be your downfall though for as you struggle and oppose what is coming at you there is a good chance that you find yourself further immersed in the situation and more than likely in a way you do not wish to be. If you find yourself in a situation like this today, one where you are not willing to back down and the opposition you find in taking this stance is equally as stubborn then you may wish to think on what it will accomplish by fighting your corner as the other person is equally as adamant in their views. Perhaps it would be a better idea to give the situation a few days to cool off and allow the Mercury Mars square to weaken which will allow for clearer thinking and insights into your situation. This gives you a chance to ask yourself the pertinent questions of what will happen if I continue in my current course of action, what will the fallout be and importantly… how much energy am I willing to further expend when everything I am doing seemingly makes little or no difference? The card used for today’s tarotscope — Five of Wands — is card is part of the Sorcerers Tarot by Antonella Castelli, who also designed the Tarot Art Nouveau and the Astrological Oracle cards.